This is definitely another of the books that I was eagerly awaiting this year, just like Always With Love. 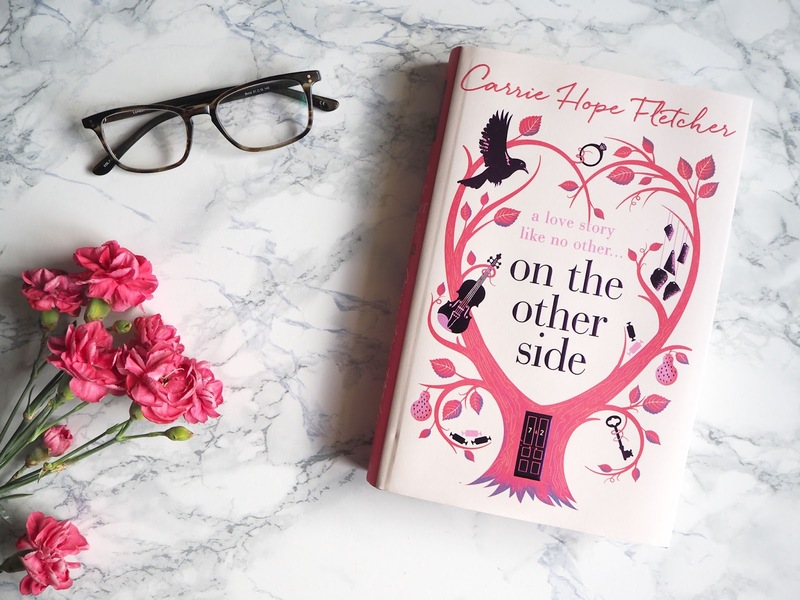 I read Carrie Hope Fletcher's debut book All I Know Now last April, and although I loved it, I also found that it was aimed at a much younger audience than myself. Carrie and I are the same age, and have similar interests, so when I found out she was releasing her debut novel On The Other Side this year I knew I was going to love it. I picked the book up on Thursday, and read it in almost one sitting on Friday (I read a couple of chapters to and from work on the train first) because I just couldn't put it down. The story follows Evie Snow, an eighty-two-year-old that returns to her twenty-seven-year-old self when she passes away. Evie has three secrets that are weighing her soul down, and she must finally reveal them so that she can pass through to heaven. The story itself is beautiful, and definitely one I've not seen done before. It's magical, it's beautiful and it had me in tears at points. Although it flits between past and present, it's extremely easy to follow along. I sometimes struggle with books that do this, and although it may be because it's quite a light read, Carrie has done this seamlessly. The characters were also completely relatable, and I really loved Evie. I could see some parallels between her and Carrie (including Carrie's green coat) and I'm sure a lot of fans will be happy about that. Vincent and Jim were also characters I fell in love with, one being the one that had Evie's heart, and the other being the best friend who knew that the girl he loved would never love her back. Carrie also included characters that were Bisexual and Pansexual, which was a lovely addition and still something that is fairly unusual to come across in the book world. Can we also just talk about the cover for a second? It's absolutely stunning, and I'm not sure I even own another just as beautiful. The colours are gorgeous, the illustrations are too, and it completely encapsulates the storyline, with everything on the cover being an important aspect. The cover under the sleeve is also gorgeous, just like that of All I Know Well, and once again the Hopeful logo has made it to the back cover as a lovely nod to Carrie's fans. Overall, I loved On The Other Side a whole lot. It was magical, had me on a rollercoaster of emotions, and I completely fell in love with the storyline. It's definitely a strong debut in the fictional world from Carrie, and I cannot wait to see what she does next.